All-rounder Zak Chappell, who is keen to make an impression at Trent Bridge. 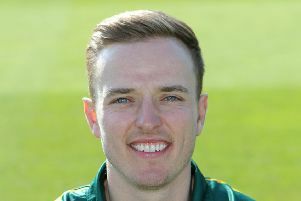 New signing Zak Chappell emerged from the shadows to spend part of the day on the field as Nottinghamshire’s opening Specsavers County Championship match against Yorkshire wound down towards a draw. Chappell was a fielding substitute for Chris Nash, who had picked up the kind of slight niggle that the former Leicestershire man knows all too much about. “I’ve had a bit of a side strain that has kept me out for the first couple of matches,” he said. “But I can’t wait to get started now. While many of Notts’s other recent signings have already made their mark, Chappell has had to watch from the sidelines, but he is keen to make an impression of his own. 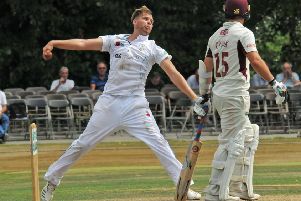 The 22-year-old all-rounder was much in demand after deciding to leave Grace Road but explained why he turned down several other offers to stay in the East Midlands. “Notts appealed to me for lots of reasons,” he said. “It’s just up the road, it’s a Test match ground, a Test match wicket and there are a lot of senior players and good coaches around, so it was hard for me to say no to that.